Angus producers competed for top honors during the 2019 National Western Stock Show (NWSS) Angus Carload & Pen Show, Jan. 19 in Denver, Colo. Three carloads and 30 pens-of-three were showcased in the Yards during the 113th NWSS. Joe Myers, Harrodsburg, Ky.; Doug Schroeder, Clarence, Iowa; and David Medeiros, Denair, Calif., evaluated the bulls and heifers before selecting champions. Krebs Ranch, Gordon, Neb., claimed grand champion carload, with 10 January and February 2018 bulls sired by KR Hitch, TEF Outside 514, Panther Cr Incredible 6704, Bushs Tundra 602, May-Way Equity and KR Abundant 4948. The group weighed an average of 1,383 pounds and posted an average scrotal circumference of 38.4 centimeters. Express Angus Ranches, Yukon, Okla., exhibited the reserve grand champion carload with January 2018 bulls sired by HA Cowboy Up 5405, EXAR Monumental 6056B, KCF Bennett TheRock A473, 3F Epic 4631, KCF Bennett Fortress and S Whitlock 179. The ten bulls posted an average weight of 1,486 pounds and an average scrotal circumference of 39.0 centimeters. Express Angus Ranches showcased the grand champion pen of three bulls with January and February 2018 sons of Baldridge Colonel C251 and EXAR Spread 5767B. The trio posted an average weight of 1,418 pounds and an average scrotal circumference of 37.3 centimeters. 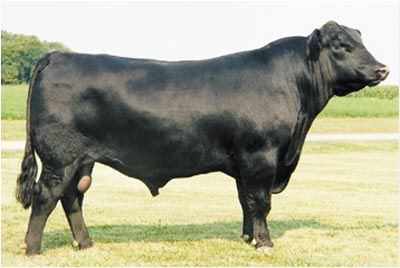 The bulls first won early calf champion. Bush Angus, Britton, S.D., captured the reserve grand champion pen of three bulls after first claiming reserve early calf champion. The January and February 2018 sons of Bushs Date NIGHT62, Panther Cr Incredible 6704 and VAR Seedstock 653 posted an average weight of 1,408 pounds and an average scrotal circumference of 38.7 centimeters. Chestnut Angus Farm, Pipestone, Minn., showcased the grand champion pen of three heifers with January and February 2018 daughters of 3F Epic 4631 and Chestnut Royal Stockman 326. The trio posted an average weight of 1,100 pounds. The heifers first won early calf champion. Oklahoma State University, Stillwater, Okla., captured the reserve grand champion pen of three heifers after first claiming reserve early calf champion. The January and February 2018 daughters of HA Cowboy Up 5405 and Connealy Confidence Plus posted an average weight of 993 pounds. Judges: Joe Myers, Harrodsburg, Ky.; Doug Schroeder, Clarence, Iowa; and David Medeiros, Denair, Calif.
Grand Champion Carload of Bulls: Krebs Ranch, Gordon, Neb. Reserve Grand Champion Carload of Bulls: Express Angus Ranches, Yukon, Okla.
Late Calf Champion Pen of Three Bulls: Krebs Ranch, Gordon, Neb. Reserve Late Calf Champion Pen of Three Bulls: Dandy Acres Angus, Pipestone, Minn. Early Calf Champion Pen of Three Bulls: Express Angus Ranches, Yukon, Okla.
Reserve Early Calf Champion Pen of Three Bulls: Bush Angus, Britton, S.D. Champion Yearling Pen of Three Bulls: Krebs Ranch, Gordon, Neb. Reserve Champion Yearling Pen of Three Bulls: Colorado State University, Fort Collins, Colo.
Grand Champion Pen of Three Bulls: Express Angus Ranches, Yukon, Okla.
Reserve Grand Champion Pen of Three Bulls: Bush Angus, Britton, S.D. Late Calf Champion Pen of Three Heifers: JT Weber Family, Lake Benton, Minn. Early Calf Champion Pen of Three Heifers: Chestnut Angus Farm, Pipestone, Minn.
Reserve Early Calf Champion Pen of Three Heifers: Oklahoma State University, Stillwater, Okla.
Grand Champion Pen of Three Heifers: Chestnut Angus Farm, Pipestone, Minn.
Reserve Grand Champion Pen of Three Heifers: Oklahoma State University, Stillwater, Okla.